The Austin Champ (Military Version) was procured under contract 6/VEH/5531 dated 1 August 1951. 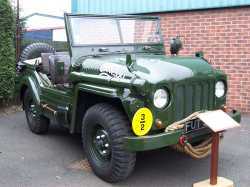 The development of the 'Champ' (officially the "Truck, 1/4 Ton, 4x4, CT, Austin Mk.1" - the name 'Champ' only officially applied to the relatively few sold in the civilian market) followed experience with American built Jeeps during World War 2, and a desire to have a British built equivalent. 11,732 were produced at the Cofton Hackett works, part of Austin's Longbridge complex in Birmingham, and they entered service between September 1951 and January 1956. Early Champs received Rolls Royce engines, but later models (including this one) received Austin engines using Rolls Royce tooling. The 2838cc petrol engine results in fuel comsumption of approximately 15 miles per gallon. The cost of the vehicle when new is believed to be £2,500 - ie the equivalent of four Land Rovers at the time. Some say that the same vehicle today would cost around £50,000. The Army later standardised on Land Rovers, which were cheaper to produce, and could perform most of the tasks that a Champ could, and most Champs had a relatively short operational life. This particular Champ entered Army service in November 1954 and it was sold at Ruddington in October 1965 - lot number 484. It was with the Army for approximately 10 years but unfortunately there is no record of where it spent its service life. If anyone has any "in service" information regarding this vehicle, we would be pleased to hear from you. It has had three civilian owners since 1965.